Starring Kim Hye Ja, the Queen from Goong. Obviously that series didn’t even scratch the surface of what Kim Hye Ja has to offer as an actress. She is amazing in the role as the Mother a truly Oscar worthy performance. The son, Do Joon is played by Won Bin. Won Bin was amazing as I could never really figure out if Do Joon was slow, or just strange, or what he was. He played the character to perfection, never breaking, never did you even see a glimmer of who the actor really is, he was completely the character to much eerie effect. I haven’t seen Won Bin in any other series or movie, but have obviously seen the cute commercials he is in with Shin Min Ah and he is so far from this character, I never would have linked the two. Bong Joon Ho directed the film and though I haven’t seen any of his other much tauted works he is obviously extremely talented. Some of the imagery and the overall tone of the film were exquisite. One scene showed two cherry tomatoes rolling around a plate that totally unsettled me. The film is a perfect balance of credibility and a balance between the simple and the complex. I never felt sure of myself or of anything the entire time I watched it. With incredible depth, cinematography, acting, tone… I could go on and on… This film is a good representation of some of the most exquisite elements that seem so unique to Korean film. Jin Goo as Jin Tae was also amazing (per norm, I love a bad boy) , and the cops, one of them was from IRIS, Yun Je Mun. Basically I can’t believe this lost out to Thirst for the Academy Award selection. 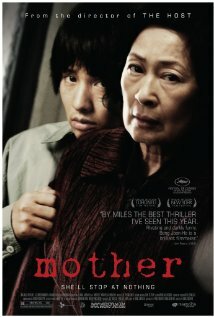 Great film for those that like the Korean film or just enjoy great film making.